Here's the link to the newspaper article & video. No matter what the product, there's always someone looking to cheapen it to take advantage of people on tight budgets. Then the quality companies have to follow suit in order to compete and then you can't get quality anymore. Good for New Jersey. The inspectors should make Walmart their first stop. 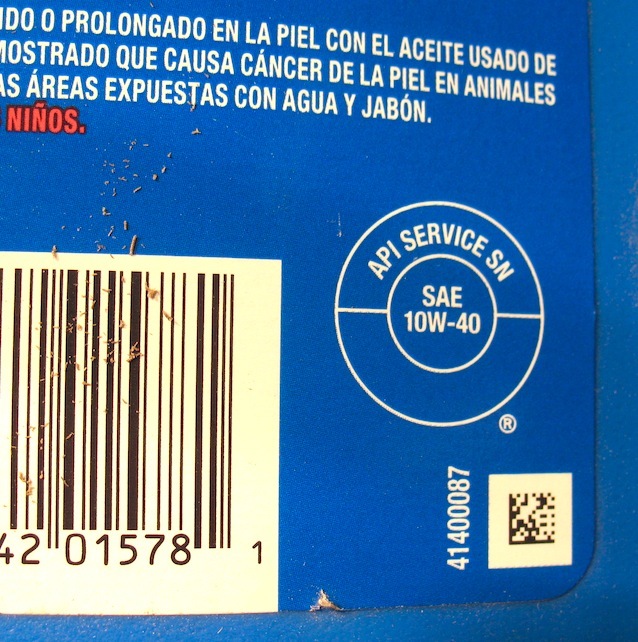 Look for the API service label on the back of the bottle. I believe that Walmart carries all API rated oils. Where you really have to watch for the garbage is at the types of places noted in the article. Service ratings that start with a 'C' (CH-4, CG-4, etc.) are for compression engines and ratings that start with an 'S' are for spark engines (SL, SJ). Rating labels with both will work in both types of engines. Example, Rotella has the top center rating. I run an auto parts store, and people complain about oil prices constantly. We make very little profit on oil, it's simply something that you have to sell. I'm always told they usually buy it at Dollar General or Wal-Mart at a fraction of our prices.....Buyer Beware! This is really not that new. For instance did you know that 2 cycle oils have been rated for years? Now I've been out of the trade for a few years but I know (knew ?) the following: Rating was voluntary. It didn't have to be done. 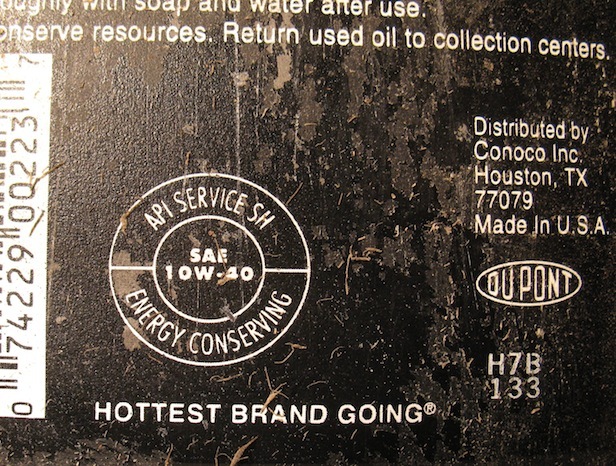 The rating system ran from the letters B through F. It appears in a cartouch or elongated circle on the back label. F was the highest at that time. As stated you have to look for it. Red Max carried the highest rating with an F. Echo brand oil carried no rating at all. Part of the requirements for rating involved engine size, rated HP, lubricating qualities and resistance to carbon formation. You get what you pay for. By the way, if some of the banned oils were selling for up to $6 a quart as stated, I don't call that cheap. Certainly not a case of getting what you pay for. So let me throw a little more oil on the fire. I'm assuming these inadequate oil brands are sold nation wide. Does this mean that the guys that are buying the cheapest oil possible for their T's have been kidding themselves? "Any thing out there today is better than what was out there years ago" is the famous phrase. If it's not even what the label says that can't be good. New Jersey is only about 2 1/2 years late in protecting it's consumers. The list is substantially larger and includes at least 15 brands of ATF that don't meet standards. I wonder why the governor chose only 19 of the oil brands? Perhaps they weren't political contributors. I know, I know; "sit down and shut up". Well, all this means is that the inventory will be shifted to other states like ours and be sold. Just a slight trim in bottom line because of having to haul it over state lines to sell it elsewhere. Just kicking the can across the line,not solving a thing. As I read it, all the oils I pictured above are OK for your T. The current price for Pennzoil here at the local Wal-Mart is $4.24. The same grade of Castrol is $4.34. Valvoline is $4.47. Quaker State is also $4.47. The Wal-Mart house brand is $2.74. It's a free country. Folks who want to pay an extra buck and a half a quart for fancy advertising are welcome to do so. The radio news broadcast stated that it also included any markets that carried oils that specifically stated "not to be used in engines manufactured after 1930", and that any store in violation of this would be fined 100 dollars per unit on the shelf. Every Auto Zone and Advance Auto carries these products. 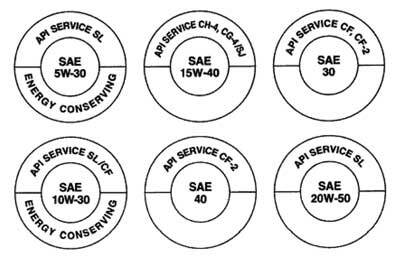 Here is a little more information on oils that have the API "donut" and the differences in oils based on the rating category. 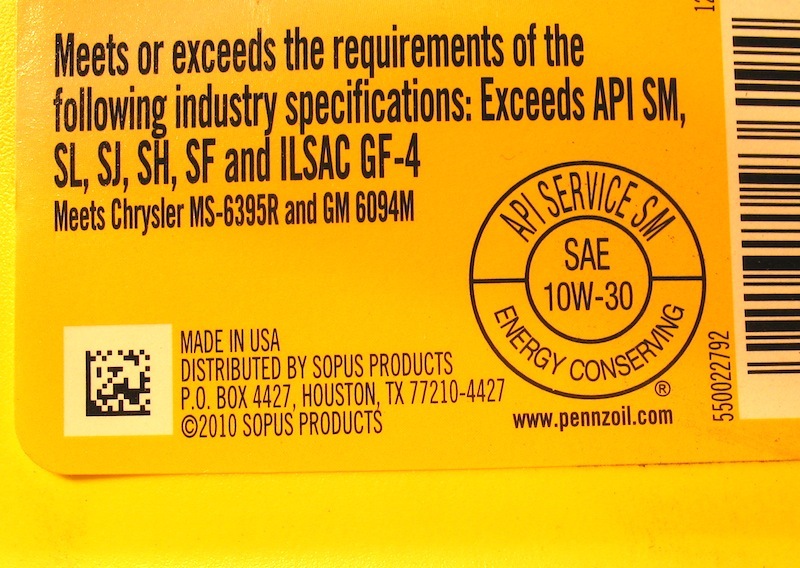 But the bottom line is to not buy an oil without the rating symbol as it may not even meet the most basic requirements regardless of the vehicle's age. I didn't mean to be redundant with the API information. I was a little slow with my posting. By the way, I emailed Ken's link with the list of states which have acted on this to the Kansas attorney general's office and asked why we're not on it. If your state isn't on the list, there's a homework assignment for you. 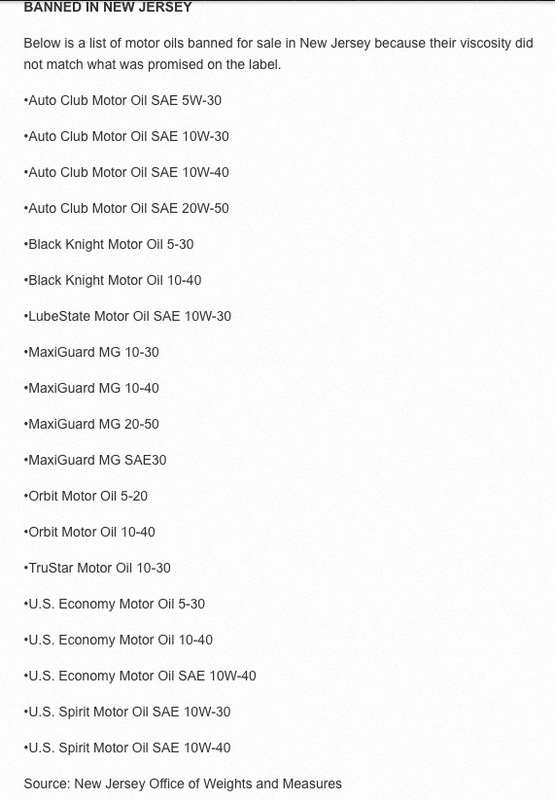 I wonder if you mixed acetone with any of the brands listed would it loosen a stuck engine? Two schools of thought. Doing hundreds of G sales you often run into un opined name brand oil and solvent folks can not put on there moving van so they give it away or sell a quart for a dollar or less. With Ts, lawn mowers, chain saws, etc. I can buy a Z head about every six months with money saved in retirement. Ah com-on now !! I'm just tryin' ta make a deal hear. HUH ?? What-ta ya want from me? Huh?? Always yankin' my chain here, HUH ?? Its Christmas every week end with G sales George. Besides consumables used for home, cars, and shop upkeep my bride is very happy with her buys that she is very good at. Lets see you buy a brand new Maytag gas range and a brand new whirlpool dish washer for a hundred dollars any where? The folks just bought a new home and wanted different appliances so out the door they go! A long time friend who has not had a real job since the early eighties taught me lots of tricks with garage sales. Any one on a budget should learn them. which I promptly lost on the way home.